A photo gallery of roofing projects by Patriot Roofing. Patriot Roofing Services, Inc. is your choice for quality, professional and affordable roofing services in Orange Park, Middleburg, Jacksonville, St. Augustine, Nassau County and throughout all of Northeast Florida. We will help you select the perfect roof for your home or business, whether that is metal roofing, clay tiles or shingles, then install it professionally. We also provide roof repairs and regular roof maintenance to help keep your roof in tip-top shape. At Patriot Roofing Services, we dedicate ourselves to exceeding your expectations, and then we guarantee it with our 10-year warranties. 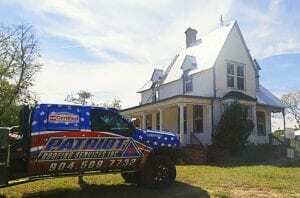 As a local, family-owned business headquartered in Clay County, Florida, Patriot Roofing Services is committed to helping our neighbors protect and beautify their homes with a dependable and attractive roof. Patriot Roofing Services provides both commercial and residential roofing services in the greater Jacksonville area. As a roofing contractor in Orange Park, Patriot Roofing Services offers several options to home and business owners in the area. Our services include roof repair, installation, and maintenance. Through these services, we provide durable roofing with innovative and trusted techniques. Homeowners often come to us for residential inspections, cleaning and ventilation, and even custom made gutters. Business owners also benefit from our wide supply of commercial roofing options. No matter your goals, we will strive to meet your roofing request. We understand the special nuances of serving commercial and residential clients. But, we also know that whether they own a home or business, our clients appreciate the safety of a secure roof. Find peace of mind about your investments with Patriot Roofing Services’ professional services and expert repairs. Because our founder started out as a roofing foreman himself, we understand that good roofing depends on every person involved in the process. Our employees, from the workers laying shingles all the way up to the project leaders, focus on careful and expert work. What’s more, you’ll find that every project—no matter how big or small—receives attention from our owner. This hands-on approach ensures every job is clean and efficient. Our commitment to our customers includes completing your roof repair or re-roofing project as quickly as possible and leaving your yard clean and free of debris when we are finished. Whether you need a roofing contractor for new construction or a simple repair, Patriot Roofing Services provides comprehensive options and a well-supervised team. With over 10 years of experience, we know what it means to provide professional roofing services in Jacksonville, Orange Park and around the First Coast. Let us show serve you with friendly and reliable work. Contact us today to learn more or get a quote at (904) 509-7732.